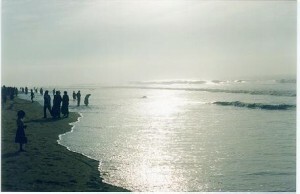 For centuries now, the Puri beach has been the venue of countless pilgrims dating the traditional purification dip. Both foreign and Indian beach-lovers have it made it their special haunt. The crashing surf on one of Indian’s finest beaches is a glorious sight. It would be best not to be too adventurous the undertow can be a bit treacherous. Puri beach offers tourists the rare opportunity of witnessing the colourful sunrise and sunset on the same beach where they can bath and laze for hours on the golden sands. One can also see and enjoy traditional fishermen in hundreds, flying their catamarans or sail boats and drawing into their nets rich catches of prawn, pomfret and other fish on this long and wide beach extending for miles. Jagannath Puri: Just the place to witness and take part in colourful festivals round the year, Puri is famous for its celebrated annual festival of Chariots, the Ratha Yatra. Held in the beginning of the monsoon it has been attracting pilgrims and tourists for centuries. Bada Danda: The Grand Road is ideal for a leisurely stroll and shopping for souvenirs and mementoes. Typical Puri Handicrafts include miniature stone sculptures, wood carvings, seashell items and colourful appliqué work. One can also pickup this pieces from art and craft complex at Mochisahi, Sudarshan Craft museum at station road. Utkalika at Grand Road and sea beach, Crafts Development Centre at Batagaon or from shops at the southern end of the beach at Swargadwar, literally, Gateway to Heaven. Balighai: Balighai is situated 8 km away from Puri. It is sea beach and Sea Turtle Research Centre is situated here. One could enjoy the glamour of Balighai beach amidst casuarina plantation. Raghurajpur: Raghurajpur is situated 14 km away from Puri. It is an Artesian village. Beleswar: Beleswar is situated 15 km from Puri. Shrine of Lord Beleswar Shiva is located in the sea beach of Beleswar. Sakshi Gopal: Sakshi Gopal is situated 20 away from Puri. Shrine of Lord Sakshi Gopal and Samadhi of Panchasakha is located here. Brahmagiri: Brahmagiri is situated 25 km from Puri. Here shrine of Lord Alaranath, worshipped as Jagannath during ‘Anavasar’. Baliharachandi: Baliharachandi is situated 27 km from Puri. Shrine of Harachandi on the desolate sand dunes and a nice picnic spot is located here. Satpada: Satpada is located 50 km away from Puri. It is a scenic spot on Chilika, ideal for bird watching and viewing cavorting Dolphins. This entry was posted in Miscellaneous, Orissa, Puri, Seabeach and tagged jagannath puri, puri india, puri tourism. Bookmark the permalink.